I was complaining last week about the shallow approach to soul-building often found on the self-help shelves. Complaining is not exactly the sort of behavior that fosters, or is compatible with, contentment, but there you go. It seems I am so incorrigible that a stronger prescription is in order. I need serious help. So I thought I would try these guys. Watch out, Lightweights. Here come The Marble Heads. It’s not that easy to figure out what philosophers have to say on contentment, except in sound bites on the Internet. Putting those quotations in context is a bit harder than you might think, unless you just came out of school with a philosophy degree. Even then, it’s hard to write a blog post while you’re driving cab. I ended up out on a limb. To be precise, on that branch of philosophy known as Ethics. We tend to think of ethics as synonymous with morality, but there’s a little bit more to it than that. 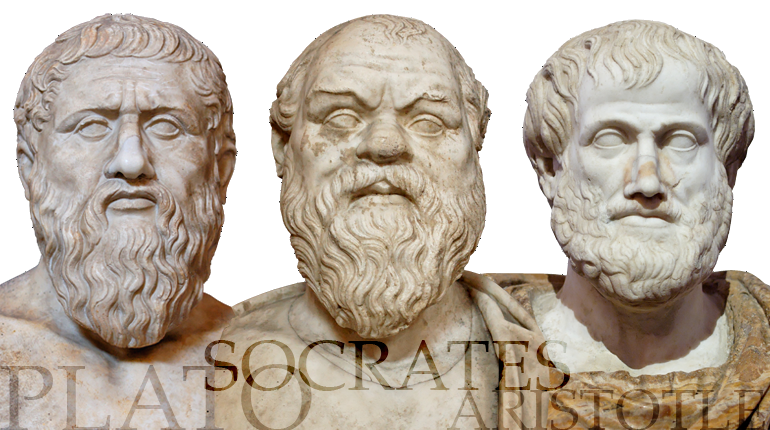 Ethics comes from the Greek word “ethos,” which means custom or habit. Ethics as a philosophical discipline explores the nature of right conduct and the good life – what sort of behavior causes the greatest good, what sort of life is most worth living. It’s in this broader sense of ethics that you find contentment addressed. 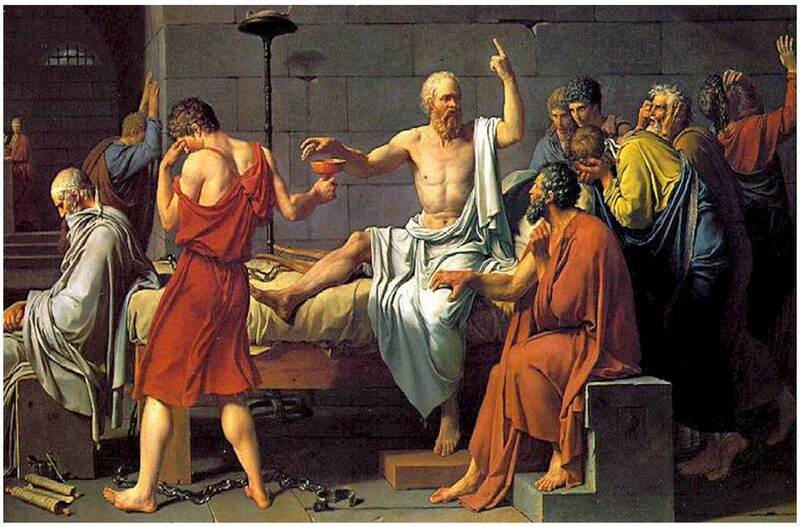 In the West, at least, the study of ethics begins with Socrates. Socrates lived from 470 or 469 BCE to 399 BCE, when he was famously executed for “corrupting the youth of Athens.” He thought people naturally gravitate toward the good if they know what is right, and that evil or bad behavior is primarily caused by ignorance. For Socrates, self-awareness is primary: knowledge, wisdom, virtue, happiness all depend upon it. Admirable and wise, though if I had been Xanthippe, his famously shrewish wife (Socrates had two), I also might have been discontented enough to dump a chamber pot over his head, given his already execrable personal hygiene, his lack of gainful employment, and his neglect of his own sons on behalf of all those corruptible youth. Socrates was a spouse to contend with, which was what he apparently wanted as well. Plato (c. 428 – 348 B.C.) doesn’t really define contentment. But in The Republic, he tells you what contentment is worth. At least that’s what the Internet tells me. Plato himself was from an aristocratic family, and pretty well off. I’ve tried to find this quotation in The Republic itself, but whether the translation available to me (Benjamin Jowett’s, in the Internet Archive) does not correspond to the translation from which the quotation is taken or no, I’m unable to find the words in context. The quotation has also been attributed to Socrates, which makes sense, since all the quotations we have from Socrates come through Plato. All the same, I find it telling that Plato is also responsible for the first reference in literature to the myth of Atlantis, an arrogant nation not content to rule itself alone that falls out of favor with the gods and sinks into the Atlantic Ocean. For which I must thank him, since he’s given me a #FolkloreThursday post for the month. Aristotle (384 BC to 322 BC) believed that contentment came from acting in accordance with nature and realizing one’s full potential. But I’ve also seen this translated as “Happiness is self-sufficiency,” which strikes me as a little different. On top of that, the word we translate as happiness, eudaimonia, is itself a nuanced concept. It has also been translated as joy, well-being, the state of human flourishing, and the good life. Rather like contentment, it’s a bit difficult to pin down. Most of us are more familiar with eudaimonia in a psychological framework; Abraham Maslow’s “hierarchy of needs” leading to self-actualization has much in common with Aristotle’s notion of human flourishing. Given that Aristotle believed in the Golden Mean, or balance and moderation in all things, being content would have to be necessary to that happiness. Then again, his most famous pupil was known for his ambition, not his content. 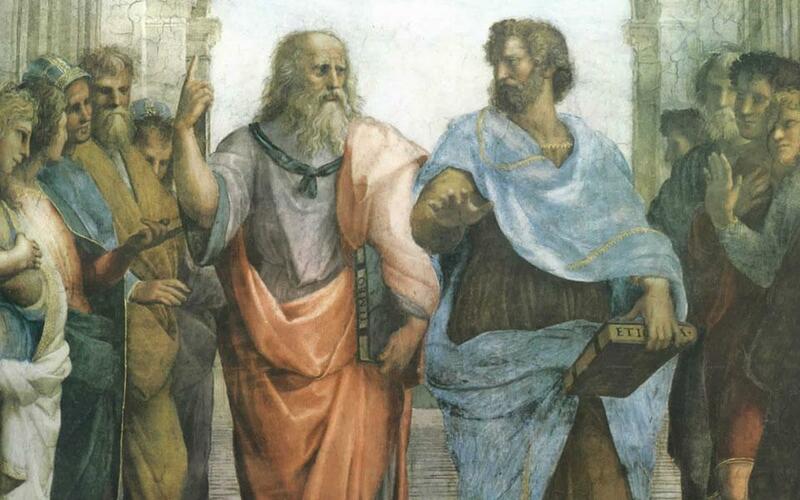 It could be dangerous to be a philosopher in Athens, as Socrates and Aristotle both discovered. Aristotle was Plato’s most brilliant pupil, but in realizing his own full potential, he found it hard to toe the Platonic line. Plato’s nephew ended up his successor instead. 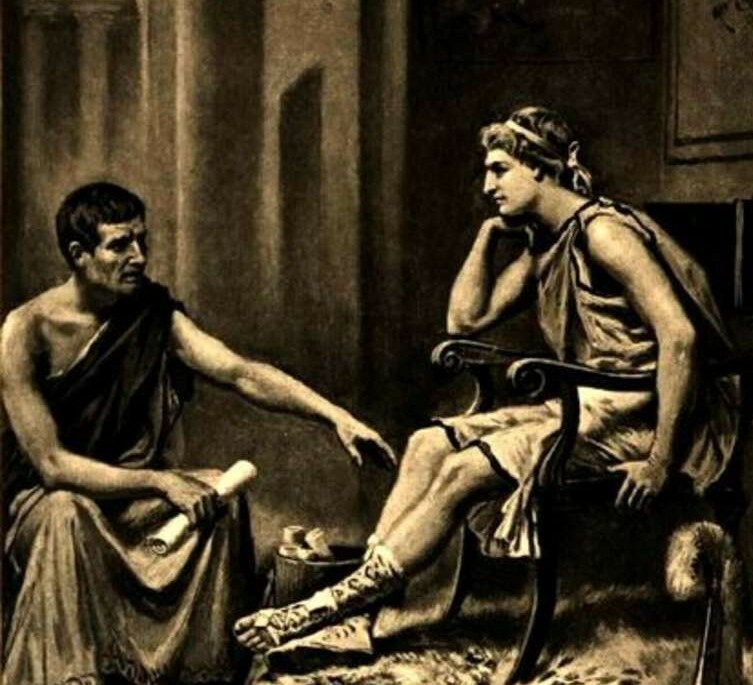 Eventually Aristotle ended up in Macedonia, tutoring the young Alexander. Aristotle, too, did not need to be “content with little.” In fact Aristotle may have been one of the most highly paid philosophers in history. Alexander went on to conquer Athens, allowing Aristotle to return and set up his own school, the Lyceum. But after Alexander’s death – probably of typhus in the swamps while trying to extend his empire into Babylon – Athens rebelled against Macedonia, and Aristotle, suddenly charged with “impiety,” had to flee for his life. He died shortly thereafter, probably wishing he’d spent more time with Alexander on that Golden Mean. Ironically, the Greek philosopher who most embodied contentment was Plato’s greatest nemesis. Diogenes the Cynic was not one of the Big Three. But he was the biggest contentment badass of them all. As such, he deserves a whole post to himself. If they’d ever had access to the internet, we’d probably get entirely different answers. I do agree that most self-help books are focussed upon pulling onseself up by one’s own bootstraps AND THEN..all the good stuff will happen. Which it doesn’t, so back down you go. As a Christian, I find content in believing that this world is not the end destination, therefore stressing about stuff that is ephemeral and passing, is a waste of time. Mind, I am not only in the minority, but, according to modern thinking, a very crazy, intolerant and dangerous person! Loved this post! Lots of information and sly humor. I hope you find the answers you’re looking for, because I’m sure enjoying the journey. I’m glad you’re still along for the ride, Judy. Especially since I am finding it so hard these days to get to my comments during the week. They remain greatly appreciated. I love your posts. Look forward to them. I’m sure Aristotle’s wives did from time to time want to dump a chamber pot over his head! : ) Great post. Well, at least one of them apparently did. 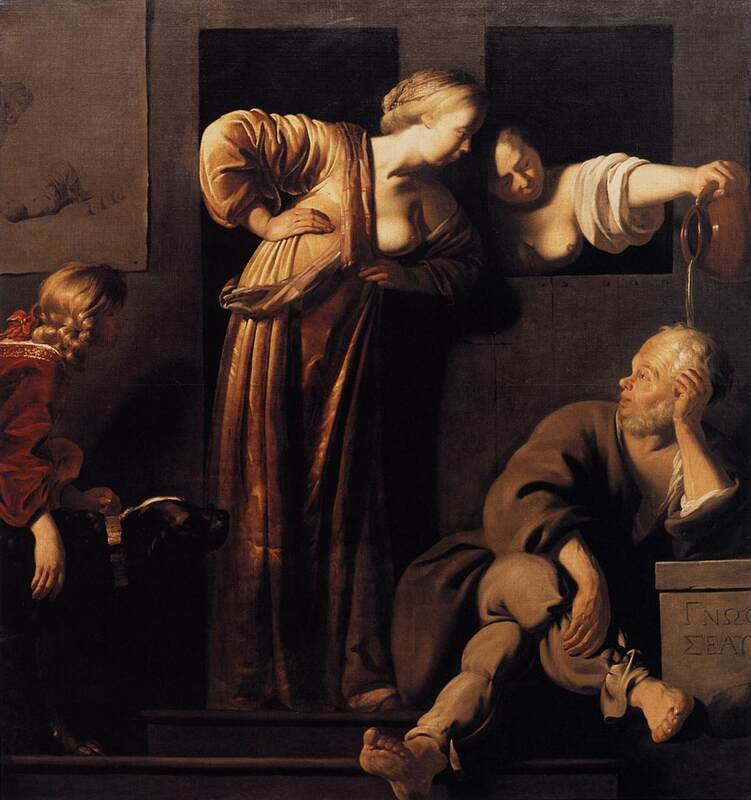 I’m thinking the wife of Reyer van Blommendael might have a similar feeling about his insistent painting of both Socrates’ wives with a breast exposed. Yes, they’re beautiful breasts, but are there babies nursing in the vicinity anywhere? Wait. Maybe I’ve answered my own question. I’m always curious about where you’ll go next. Patience? That’s a lovely euphemism for obsessive-compulsive disorder, Elaine. I think the real threat to my search is the feeling that I can’t write anything without knowing the entire context of everything. Despite giving myself that week at the end of the month, the result so far as been that the work (particularly the research) expands to fill the time. For the most part I enjoy the reading – and I’ll enjoy reading Plotinus. What I don’t enjoy is finding myself at the end of the day Saturday still not finished with the next day’s post. I believe Diogenes the Cynic would have a few things to say to me on the subject. If, that is, he weren’t busy chastising Alexander the Great, as you’ll see in this week’s post. Whew. Narrow escape there. Nobody wants to be chastised by a philosopher.